Acute, like the three angles of a triangle. Acute, as in its three sharp points. 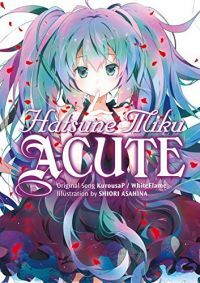 Acute is the tragic relationship between three Vocaloids: Miku, Kaito, and Luka! Once they were all friends making songs--but while Kaito might make a duet with Miku, or a duet with Luka, a love song all three of them sing together can only end in sorrow! Based on the song with over 4.4 million combined views on YouTube and NicoNico.